Hello everyone. OMG IT'S FREEZING HERE! What crazy weather. What else is there to do when it's so cold but work on projects. 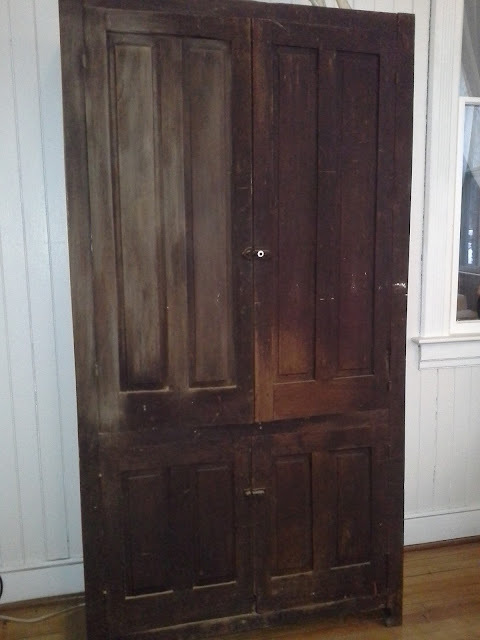 I finished painting this old cabinet that is in the great room. I decided to paint it white. Really turned out nice. Brightened the whole room up. What a change lighter colors can make to a room. The room appears larger now also. I also had a dilemma after painting this piece. The old white horse on top of the cabinet now just appears out of place in color. So I swapped it for a basket and went out in our backyard and cut some twigs to add height. Our ceilings are 12 FT tall . I also played around with another little arrangement, thinking spring! I seem to get side tracked with fun projects when I should be doing paperwork (taxes). I do work well under pressure though. When I was a nurse, it came in handy! Well, that's all the happenings around here today. Hope you have a great evening. Added a basket filled with twigs for some color instead of the old horse. I love to see transformations like this. Thanks for showing us. It looks so lovely. What paint did you use? i will be painting some pieces soon and I want them white. Hello, wonderful to visit your blog..What a great way to meet like minded women..Still working my way thru all the blogs..such delight. I really like the frame and the basket on top.